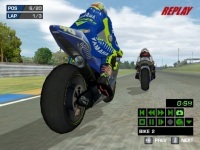 MotoGP: Ultimate Racing Technology 3 is a MotoGP Grand Prix and Extreme motorcycle racing game published by THQ in 2005. It implements the racing season of 2004 GP. With touch of realistic graphics on the environment, it brings users an exciting experience to taste MotoGP game on every angle. When a race ends, users can watch the replay video with many buttons including camera views, giving exotic adrenaline scenery on every bend of the track. In this demo version, player can take a grand prix race on Le Mans circuit and extreme street race under the night sky in Tokyo. Arrow keys = Accelerate / turn right,left / brake. Z / X = Front / back brake. F / G = Lean.